These are my top two natural cleaners. They just can't be beat. I buy a 13.5 lb. bag of baking soda from Sam's Club and a large jug of store brand white vinegar at the grocery. Add some dish liquid and hot water and you can clean just about anything. Bathtub/sink scrub - Run a little bit of hot water into the plugged tub (just about a 1/2-1 inch over drain) while getting sides of tub wet. Sprinkle about 1/2-3/4 cup of baking soda all around tub sides, then drizzle a little dish liquid (I use Seventh Generation natural dish liquid) over it. Use a scrubbing sponge to scrub tub in circular motions until clean and smooth. Unplug drain and rinse tub with hot water. Drain cleaner - Put a large pot of water on the stove and bring to a boil. Meanwhile, pour 1/2 cup baking soda into drain. Pour about a cup of vinegar down drain. Let sit for about 5 minutes; pour boiling water down drain. Use a plunger (carefully, your drain is full of boiling water! ), if drain is still going slow. Sometimes that helps to loosen the soap scum and hair. Run hot water to test drain. If it is still slow, it may need a second treatment. If you do this regularly, you're less likely to need a plumber for simple clogs. 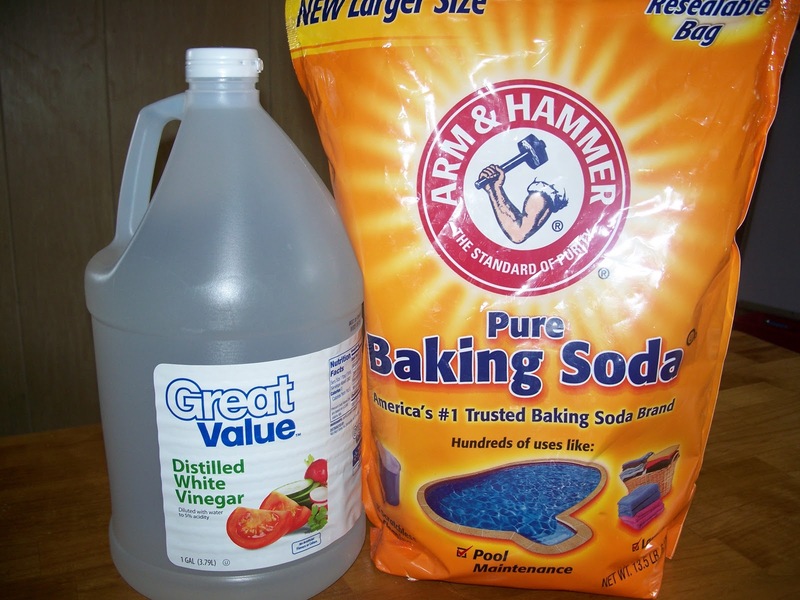 Toilet bowl cleaner - Sprinkle baking soda around inside of bowl, add 1/2 cup vinegar to water, use toilet brush to scrub, and let sit as long as possible or overnight. Mildew remover - Ever leave a load of clothes in the washer overnight? ;) Wash on warm or hot and add 1 cup vinegar. Wash again on normal with detergent. Fabric softener - Add 1/2 cup vinegar to rinse cycle. Stainless steel pots & pans - Burnt food stuck to the bottom of pan? Sprinkle a layer of baking soda in bottom of pan, drizzle a little dish liquid, and add about an inch of hot water. Let soak for a while. Once it's softened up, use a spatula or scraper to remove food. For just regular pot cleaning, I sprinkle a little baking soda inside before washing with hot, soapy water and a scrubbing sponge. Kitchen cleaning - I clean my kitchen sink the same way I clean the bathtub. For cleaning the refrigerator shelves, sprinkle a little baking soda on a hot, soapy dishcloth or sponge and wipe down shelves. Rinse cloth or sponge and wipe shelves until clean. For disinfecting, use straight vinegar in spray bottle. Spray surface, let sit for a minute, wipe away. You can find more uses for vinegar at Frugal Fun and for baking soda at The New Homemaker. Eco Child's Play has an article about using vinegar and hydrogen peroxide to disinfect. By using baking soda and vinegar for just the above-mentioned tasks, you can eliminate at least 5-6 toxic chemical cleaners from your home and save money. I love all of these. Thank you! Thanks, Christy! I can't wait to try all these ideas, and get rid of the harmful chemical products in my house!